Revenue amounted to $214.26 million for the six month ended December 31, 2017, an increase of 1%, when compared with the $211.85 million booked for the corresponding period last year. 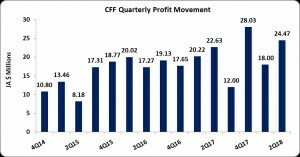 CFF noted, “ the quarter was negatively impacted by severe and unusual weather conditions which have persisted for the last six months.” The company further added, “ the company expects that there will be normality to the many issues faced during this quarter and as such expects to report an improvement in these results over the next reporting period as many of the challenges would have been normalized. Revenue for the quarter rose 4% to $114.67 million relative to $110.71 million for the comparable quarter of 2016. Cost of Sales increased by 2%% to $130.35 million compared to 2016’s total of $127.76 million for the six months ended December 31, 2016. As such, Gross Profit remained flat, amounting to $83.91 million, relative to $84.10 million for 2016. Net Finance income increased by 79% to $5.04 million compared to the $2.82 million for the same period of 2016. Profit before taxation totaled $42.47 million (2016: $42.85 million), a decline of 1%. No taxation was booked for the period under review. As such, net profit for the six months amounted to $42.47 million relative to $42.85 million in 2016. Net profit for the quarter improved 8% to close at $24.47 million compared to $22.63 million book for the corresponding quarter of 2016. Earnings per share (EPS) for the six months ended December 31, 2017 amounted to $0.47 (2016: $0.48). The EPS for the quarter amounted $0.27 (2016: $0.25). the twelve month trailing EPS amounted to $0.92. The number of shares used in the calculation was 89,920,033 units. Notably, CFF close the trading period on February 13, 2018 at a price of $10.90. As at December 30, 2017, Total Assets amounted to $406.64 million, $70 million more than its balance of $336.64 million a year prior. This increase was driven by a 47% or $42.31 million increase in ‘Short-term Investments’ to total $132.61 million (2016: $90.30 million) and a 23% or $12.32 million increase in ‘Receivables and Prepayments’ to close at $66.80 million (2016: $54.48 million). ‘Property, Plant and Equipment’ decrease by 2% to close at $15.45 million versus $15.71 million in 2016. Shareholders’ Equity totaled $373.07 million (2016: $310.02 million), resulting in a book value of $4.15 (2016: $3.45).